There is one song you must sing when you're on an Amtrak train heading to Vermont for a destination elopement. 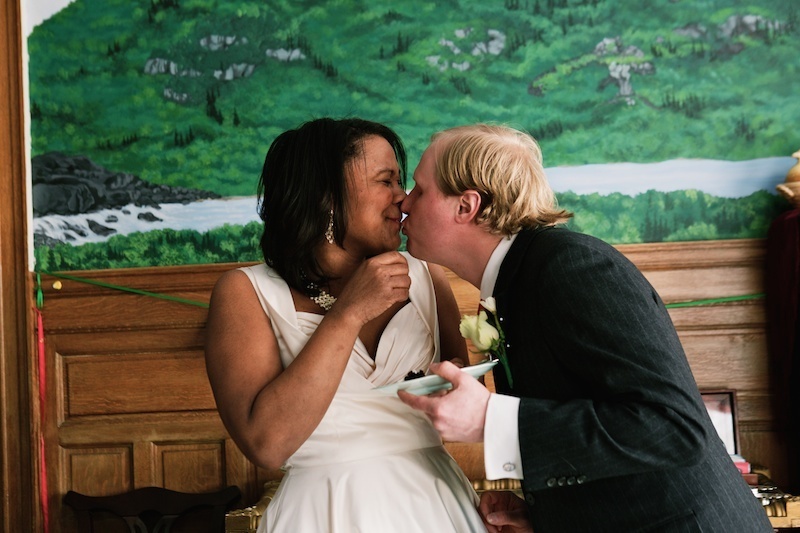 Unlike the disappointed four travelers in A White Christmas, however, we arrived in Bellows Falls to a wonderful sprinkling of snow for Steven and Zia's Vermont elopement. They met met during the chaos that New York City turned into when Hurricane Sandy hit and she was stranded shower-less. They were strangers who had friends in common, and after walking up eleven floors to his apartment for a shower, they ended up talking all night. I stayed in the Readmore Inn with them; a huge, gorgeous old house turned into a Bed and Breakfast. It was like sleeping in the movie Clue, complete with parlors that had fireplaces, sherry, and a grandfather clock that "bonged!" on the hour. We started their wedding day with Zia putting on her dress and slipping into her vintage 80's orange shoes. They did a first look in the front vestibule of the mansion and then Dorothy, who both runs the bed and breakfast and is ordained by the state of Vermont, performed their sweet ceremony in the ladies parlor by the fireplace. After their elopement, they cut their tiny wedding cake and toasted each other (the wedding cake was chocolate and absolutely amazing, also made by Dorothy who can, apparently, do everything.) Then we ventured outside. "It was cold" is an understatement; the air was so frigid it made my lungs hurt, but the snow made everything feel magic. Jim's Arcade was our first stop, where Steven and Zia played Whack-a-Gator, skeeball, and made baskets to win tickets. They played a round of pool, and then we celebrated with pizza and beer, followed by everyone falling asleep after one of the sweetest, coziest elopements ever. Late that night we retired to the gentleman's parlor which adjoins, and Zia read my tarot cards by the fireplace while we sipped sherry. It was a magical weekend.